The cost of living in Sri Lanka is going one way: UP, and that impact is reflecting on the popularity of the Mahinda Rajapaksa-led Government, an islandwide poll conducted by the Business Times (BT) and the Research Consultancy Bureau (RCB) has revealed. Asked whether the cost of living (COL) would rise this year, 100 per cent of the 450 respondents in the email poll said YES while 59 per cent in the islandwide poll conducted by the RCB said it would go up. The polls were conducted over a two week period. The RCB poll which involved interviews with 2400 respondents in the North Central, Northern, Western, Southern, North Western, Central, Uva and Sabaragamuwa provinces, was conducted over 2-3 weeks while the BT email poll was conducted over a week. The questions posed to respondents were: (1) Will the cost of living (COL) rise in Sri Lanka this year? (2) If so, in what areas would costs go up? Name 5 most critical areas, (3) 3) If the COL rises, would it be a marginal rise or sharp increases? (4) 4) If the COL rises, would it affect the popularity of the government? 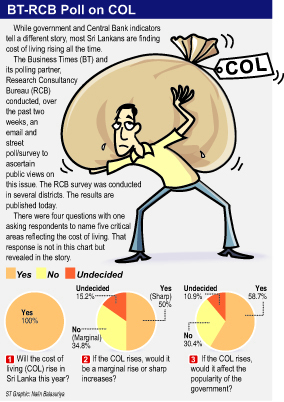 Comprehensive details and charts of the RCB poll are published on Page 8. This poll drew some caustic comments from respondents which will published next week, due to lack of space this week. Respondents in the RCB islandwide poll listed fuel, electricity bills, indispensable items, bus-train fares and gas as the five main items that affect an individual’s cost of living. In the case of the email poll, food, fuel, electricity, medicine and water were the main items. Other items listed by email respondents were taxes on food items, garbage tax, milk powder, shelter, clothing, and entertainment. -Buying power of the rupee is fast eroding. Money is worthless. Earning power is dwindling. My weekly shopping at the supermarket which was between Rs 4-5,000 is close to Rs 10,000 within a space of less than a year. What is this per capita income that we are boasting about? Who is earning this? What percentage of the population? -Price hikes are cunningly done so much so that it gives the impression that the increases are necessary to provide us a comfortable lifestyle. -COL won’t impact on a group of people who run along on BMWs, Rolls Royces, Hummers, Jaguars … and then there are the rest of us who rely on public transport or ‘old bangers’. By the way how does the ‘affluent’ group afford those vehicles? What salaries do they get or do they pay themselves? How many of them have tax files? Is this dichotomy not vulgar?